To find out how to advocate for the arts on a national scale check out Americans for the Arts. 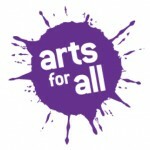 For local arts advocacy in Los Angeles check out Arts for All. Donate your time as a teacher! We are all experts: in our careers, in the lab, or in the garden. Over the course of 10 weeks, just one afternoon a week, you can share your expertise with middle school students by volunteering with Citizen Schools. Now is your chance to make a real and lasting impact. Visit Citizen Schools to learn more, and see if their program exists in your city. If you’re interested in teaching, click on the “Sign Up” button and their staff will follow up with more information.